APEX knows the value of each broker we work with, which is why we’re committed to offering the best service. But don’t take our word for it; see what our brokers have to say about working with APEX. United Financial has been providing and brokering mortgage loans since 1998. Up until last summer, we had a policy not to engage loans valued under $500,000. We received a loan request from a past client for a $300,000 loan. Even though the loan requested was below our minimum, I decided to attempt to place the loan for this client. I happened upon Apex Mortgage. Apex was eager to work this loan. As you know, most investors are not very motivated to work on these smaller deals, however Apex was the exception. They engaged the loan with enthusiasm and closed the loan quickly. Our commission was outstanding. The staff is one of the most helpful I have come across in my 13 years’ experience. Since that first closing, we have captured lost business and collected exceptional commissions with minimal effort by placing our small balance commercial loans with Apex. Today, Apex has approved a very small loan for a scratch and dent client. Although we don’t expect to break the bank with these small loans, the commissions quickly add up and create customer loyalty. 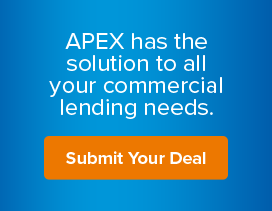 I would highly recommend anyone placing a small balance commercial loan to give Apex your first look. [Apex is] great to work with and delivers. They helped my clients close on a MHP in 3 weeks. No one else could get this deal done in that time frame. Watch-out for outfits that charge 1% upfront fee, and can’t deliver and want to keep you money. If they charging upfront fees, run the other way.